August issue on sale today, in print and online | What Hi-Fi? 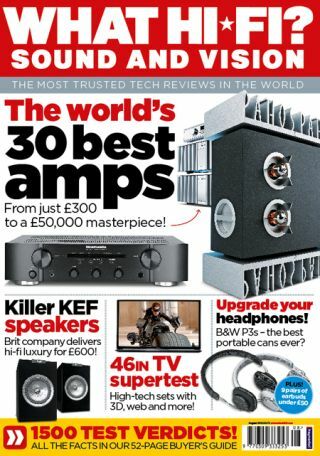 The August 2012 issue of What Hi-Fi? Sound and Vision goes on sale today, in print, online and iPad. We've gone amp-tastic this month with a special, 16-page test of the world's 30 best hi-fi amps, from just £300 to a £50,000 masterpiece. And – finally! – we've got our hands on the new KEF R100 speakers which get the full test treatment. Elsewhere for hi-fi fans you'll find reviews of the amazing Eclipse TD510ZMk2 speakers and Clearaudio Performance SE turntable in our Temptations section, and the Cambridge Audio Stream Magic 6, PMC Twenty 23 floorstanding speakers and B&W P3 headphones in First Tests. For those who want the big-screen experience in their lounge, we've rounded up a Supertest of brand-new 46-47in smart TVs from £1150 to £2000. LG, Panasonic, Sony and Samsung all take part. And we've tested some cracking home cinema kit in the form of Sony's BDP-S790 Blu-ray player and the Pioneer VSX-922-K home cinema receiver. Other highlights include our verdicts on the new Sonos Sub and Samsung Galaxy S III smartphone. And our Insider section looks at the emerging Ultra HD and OLED TV technology due out later this year – once again LG and Samsung are going into battle against the likes of Sony and Panasonic. Don't forget you could win a Hi-Fi Racks hi-fi or home cinema equipment rack in this month's competition too. All this and more is packed into the August issue, out now. You can buy it in the shops or download the digital edition from iTunes or Zinio.